I absolutely love football season, and as much as it is disappointing when football season is over, it means it is the Superbowl! One of my favorite sports time of year. Today everyone will be sitting around the TV wearing jerseys, yelling at the refs, watching some of the most expensive commercials ever made, and eating a ton of food. I, however, will be at work, so here is a recipe for you to enjoy of one of my favorite football foods. Let me live vicariously through you. Empty can of pinto beans into saucepan and simmer on medium heat. Mash beans with a potatomasher. Simmer for 5 minutes and allow to thicken. Add Mexican cheese and milk to beans. Cook on low for another 5 minutes mixing milk and cheese into beans. Stir regularly to ensure beans don’t burn.When consistency is as desired turn off and allow to cool. Cut lettuce, tomatoes, and jalapeño and setaside. Beans should cool within a half hour. After a half hour build dip. Layer beans ½ in layer of beans along the bottom of 9×9 dish. 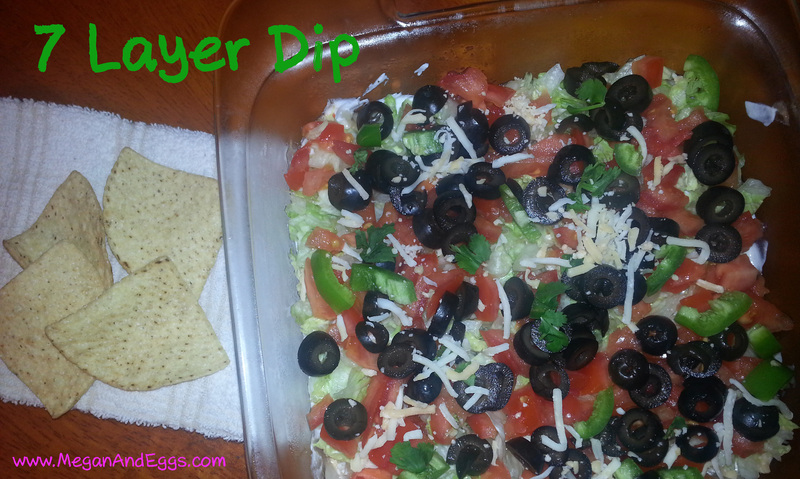 Layer on sour cream, lettuce, tomatoes, jalapeños and olives. Put dip in refrigerator and let sit. When ready to serve cut avocado into chunks and layer desired amount on topof dip. Garnish with cilantro and enjoy.